Children in Toddler E had been studying jellyfish when Brooks asked, “Are there any animals that eat jellyfish even though they sting?” To our discovery, we found that some turtles eat jellyfish. Our project focus then shifted to turtles, particularly, Leatherback Turtles. Children began studying the parts of a sea turtle through diagrams and observing photographs upon the light table. Toddlers were soon able to identify parts of the turtle such as the shell, scutes, flippers and beak. While observing pictures of different turtle breeds, toddlers became highly intrigued by the variances in turtle shells, particularly in the turtle scales (scutes). Toddlers were asked to create scutes of their own using recycled fruit jars. 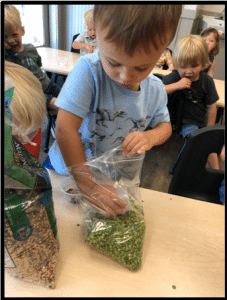 Toddlers used an array of natural materials to fill their scale: seeds, rocks and peas. 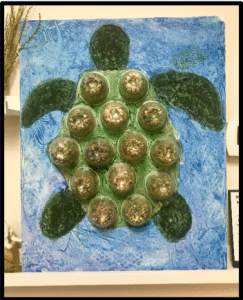 As a class, we glued each scale to a canvas to form a turtle shell. 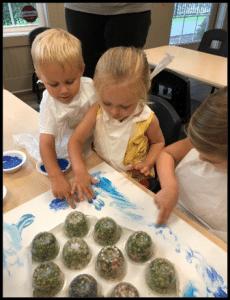 Jude stated, “Our turtle needs flippers and a head,” so we added flippers and a head to the shell using textured paint consisting of sand, glue and dark green paint. The paint consisted of rough, bumpy sand to represent the roughness of turtle skin. Vivian then said, “Ms. Alex, the turtle needs water to live,” so we added an ocean background. 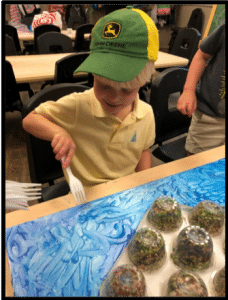 Toddlers used bubble wrap and forks to create dimension such as waves and bubbles. The collaborative creation is proudly sitting on a shelf in the science center for children to reflect on, and parents and other classes to observe.